I have been on this journey to create who I am for over a decade and consistently through that has been the word meditation. I started with Transcendental Meditation or TM (which is now quite notorious for not being as advertised but worked for me and got my mind to stop). Then I explored more Buddhist versions of meditation, discovering a marvelous book called the Diamond Mind (Rob Nairn) and another really interesting one called ‘Touching Enlightenment (Reginald Ray). I am now on a daily meditation practice using the concepts and Meditations that Dr Joe Dispenza talks about and I am loving the results! But why meditate ? Does it really change anything ? The answer is a resounding yes! Around the world more and more people are conducting experiments that show scientifically how meditation not only changes the structure of your brain, but also the building blocks of life itself, your DNA – and if you can change your DNA just by meditation, then you can change your physical expression, your health! If your brain changes, doesn’t that change how you think and what you feel and so how you experience life ? Imagine being able to change your life without winning the lottery ? Where is the proof ? Try this experiment undertaken by Heartmath set out to see if people could unwind DNA and if so, what would it take ? Would visualisation, a long established and highly popular way of manifesting do it ? Would it take you being in an elevated emotional state ? A set of experienced meditators who can measurably create the state of joy and gratitude were asked to hold a test tube containing DNA. The first experiment required them to visualise the DNA unwinding. After 2 minutes the DNA was examined and nothing had happened. The second experiment required them to hold the DNA and feel joy and gratitude. After 2 minutes the DNA was examined and nothing had happened. The third experiment had then hold the DNA, visualise it unwinding whilst being in a state of gratitude. After 2 minutes the DNA was examined and 25% of the strands had unwound. It took both a clear intent and an elevated emotion to create the change. The ability to see what it is you want (to visualise it or a clear intention) is the part that selects the possibility, it is the statement of what you want to create, what it looks like. The ability to feel gratitude and joy as if it has already happened creates the attraction, the magnetic part of the equation. Together a clear intent (visualisation) with an elevated emotion create an electromagnetic attraction that allows possibilities in the quantum field to become reality. More on quantum later, just be open to the possibility that if you can unwind DNA you can turn possibility into reality. The Science also proves that meditation practice changes the structure of your brain by using functional MRIs and other scanning technology. The more people study the science of neuroscience, the more they understand how interconnected how we think and how we behave and how we feel actually is. What it means is that who you are and how you experience life isn’t set in stone and a function of your birth. It is something you can affect and change. The brain takes sensory information and creates the thoughts that then get translated into actions and feelings and so we create our experiences. By the time you are 35 95% of those thoughts are unconscious, creating learnt habits and behaviours that we call our personality. 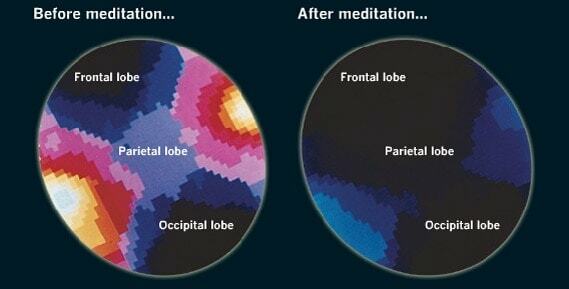 Meditation allows you to change that and create new wiring in the brain that can support different ways of thinking – from anger to joy for example. For those of you who need a quick refresh on the different parts of the brain and how they contribute to what we experience: The front brain (neocortex) is where you ‘think’. This is where you receive external sensory data and it is your connection to the outside world. It is also where your self-awareness and focus sits. Then there is the limbic brain – the chemical generator or feeling brain. The limbic brain helps you store long term memories as emotions. Then there is the cerebellum, the part that stores what you already know, the seat of the unconscious. This is the part that can enter your ATM pin into the machine even though for the life of you, you can’t remember it. This is where your habits sit.This is where what you call your personality sits. This is what you are now unconsciously competent in and yes, suffering and being a victim are things that we are unconsciously competent in as are things like driving and walking and reading. So what does meditation do ? Well for one thing it changes the neural pathways in your brain and this means you are literally changing your mind so that there are fewer pathways for say frustration and being a victim of everything and more pathways for something you would rather be feeling, like contentment or joy. This is evidenced in an increase in the grey matter of your frontal cortex and a reduction in the size of your stress centres. You feel this as a reduction in anxiety, stress and depression with improved ability to concentrate and even reduction in the feeling of physical pain. All it takes is as little as 20 minutes a day to change how you feel and so how you react and so what you experience. Makes it almost foolish to not be doing. Here are some excerpts from a more detailed article by Chad Foremen. A group of Harvard neuroscientists ran an experiment where 16 people were submitted to an eight-week mindfulness course, using guided meditations and integration of mindfulness into everyday activities. The results were reported by Sara Lazar, PhD. At the end of it, MRI scans show that the grey matter concentration increases in areas of the brain involved in learning and memory, regulating emotions, sense of self, and having perspective. Other studies also show a larger hippocampal and frontal volumes of grey matter for long-term meditators. A research group from the University of Montreal exposed 13 Zen masters and 13 comparable non-practitioners to equal degrees of painful heat while measuring their brain activity in a functional magnetic resonance imaging (fMRI) scanner. 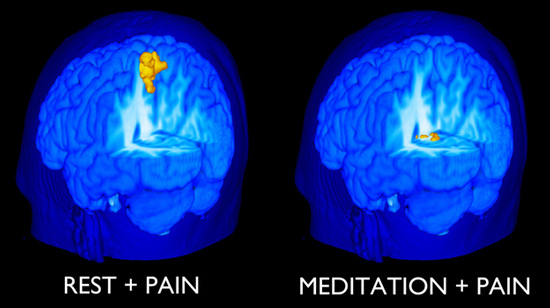 What they discovered is that the Zen meditation (called zazen) practitioners reported less pain. Actually, they reported less pain than their neurological output from the fMRI indicated. So, even though their brain may be receiving the same amount of pain input, in their mind’s there is actually less pain.